November 22, 2017 really isn’t that long ago. 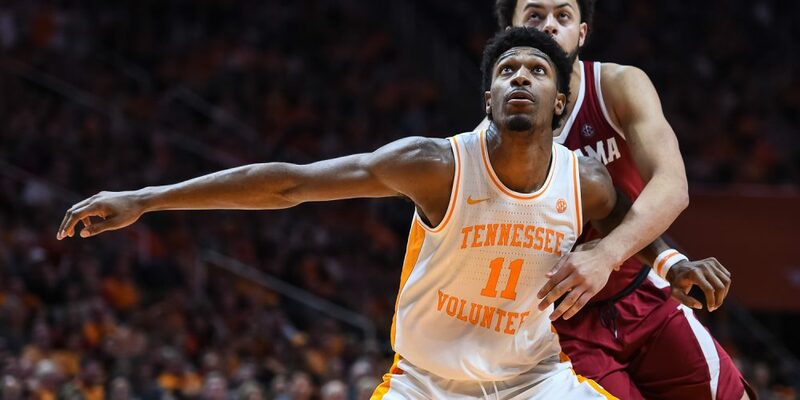 But for Tennessee’s program, that day was about getting a neutral-site win over a ranked foe to significantly boost its RPI and its early-season tournament hopes. This time, beating Purdue leads to the Elite Eight, on the other side of a No. 2 vs No. 3 showdown. Purdue miss, Admiral Schofield makes a diving save on the rebound to James Daniel with two seconds to go. Free throws, victory. Purdue went on to the NCAA Tournament as a No. 2 seed, made it to the Sweet 16, and lost to Texas Tech by 13. The year before Purdue made the Sweet 16 as a No. 4 seed, but lost to Kansas by 32. Carsen Edwards has been around for all three trips. This round has been an issue. We saw what an adventure it was for the Vols to put their second round demons to rest. What will it take to keep Purdue’s alive? Purdue has nine losses to Tennessee’s five, but since a 6-5 start (including losses to Virginia Tech, Florida State, and Michigan) the Boilermakers are 19-4. In KenPom the Vols are third in offense and 33rd in defense; Purdue is fifth and 27th. The shooting numbers are real, spectacular, and almost identical. And if you think the Vols run a lot of their offense through Grant Williams, Carsen Edwards is involved in 34.6% of Purdue’s possessions, tenth nationally. There’s a lot to love about both teams. But two things stand out in this match-up: Purdue’s offensive rebounding, and Tennessee’s shot blocking. The Boilermakers get it back on 34.9% of their attempts. Most of those attempts come from Edwards, freeing up everyone else to go to the glass. And everyone else is freaking huge: the rest of the starters all go 6’6″ until you get to the end, where you’ll find 7’3″ Matt Haarms (the Vols saddled him with foul trouble last year). Then off the bench it’s 6’9″ freshman Trevion Williams, 6’9″ freshman Aaron Wheeler, and 6’8″ Evan Boudreaux. Also, a note about starter Grady Eifert. He doesn’t get a lot of touches with Edwards and all that size. But when he touches it, it goes in: Eifert is ranked first nationally in KenPom’s offensive rating, 31-of-44 (70.5%) from two and 34-of-77 (44.2%) from three. He might be the player you’re most likely to lose in this offense. Don’t do that. Generally, it’s going to Edwards, it’s going up, and Purdue is crashing if it doesn’t go in. So there should be opportunities in transition…but the Vols have to get the rebound first. There’s some good news: the Boilermakers had 18 offensive rebounds against Michigan State, but lost (they had 13 in the rematch and won). They had 16 in a loss to Minnesota. It’s not a hard and fast rule. But it’s one the Vols have been relatively victimized by before: nine for Kansas, 10 for Auburn in Nashville, 11 for Kentucky, 12 for LSU. Purdue lives on the offensive glass. The Vols don’t always die there, but they’ve been vulnerable. But Purdue is vulnerable at the rim as well: 11.3% of the Boilermakers’ shots get rejected. This is, in part, what can happen when a 6’1″ player takes 37.4% of your shots, the sixth-highest percentage in the nation. By comparison, Admiral Schofield takes 29.1% of Tennessee’s shots to lead the Vols. Beyond Edwards, this also highlights the one-on-one battles in the paint: Tennessee has to hold their own on the defensive glass, and must be aggressive in shot-blocking without falling into foul trouble. The Vols are 11th nationally in shot-blocking percentage. Without question, this is a massive game for Kyle Alexander. The fouls bring up a consistent question down the stretch for the Vols: what will they get from Yves Pons and Derrick Walker? They’ve both played short shifts in the last few games, typically averaging about four total minutes. What happens in those four minutes? Neither is out there to score. But Pons had a turnover against Colgate and Iowa, Walker a turnover and two fouls in three minutes against the Hawkeyes. The Vols need their eighth and ninth players to do no harm. This game is a coin flip any which way you want it. It has the potential to be as exciting as the one we saw last year. So much has changed since then. So much still can for the victor.